Tanagra sounds like five guys who met while playing Magic: the Gathering, discovered they were all also into Sci-fi, history, and power metal and thought it might be cool to start a metal band. Surprisingly, not only did they actually start the band, they self-released a phenomenal record. Tanagra are from the US, but play power metal that’s deeply indebted to the European masters of the genre (as evidenced by their fantastic throwback album art and band logo). The album is chock full of catchy riffs, singalong choruses and awe-inspiring shredding but they’re not simply slaves to the genre forefathers. 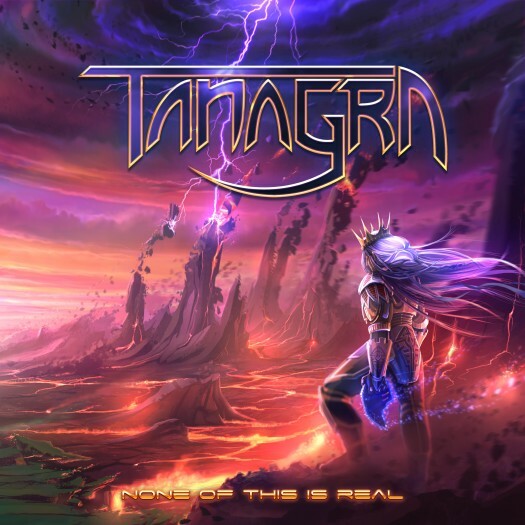 Tanagra's not afraid to shake things up, and that’s what elevates them from solid power metal to the single best “indie power metal” band I’ve found on Bandcamp. Tanagra write about the future, Back to the Future, Magic: The Gathering and the American civil war, but have an edge to almost every aspect of their music that makes their earnestness seems more badass than silly. Power metal can sometimes come off as almost laughably earnest, both subject matter and delivery, but the dark side Tanagra show keeps that at bay. The guitars sound dirtier than usual for the genre and delve into black and death metal riffs complete with blast beats. The vocals are delivered in a lower register than power metal's usual falsetto with some grit reminiscent of Chris Black’s vocals in Dawnbringer, prior to Night of the Hammer. This is mixed with some great backup harmonies like those employed by Woods of Ypres and Thrawsunblat. There’s the odd falsetto accent too, but they actually accent the songs, rather than taking them over. The musical variety is held together by excellent song writing. Riffs and vocal hooks flow seamlessly together. Each part of each song is in service of the songwriting, rather than showmanship. Near the end of "10​:​04 PM", for example, the song breaks into a 5/4 riff that I didn’t notice till I’d listened to it about a dozen times. Probably because the main riff in the song is so excellent. To top this all off the album is Pay What You Want on Bandcamp. Trust me, you want to pay something for this gem.